The United States Women's Hockey team celebrating taking the Gold Medal over their rival Canada. 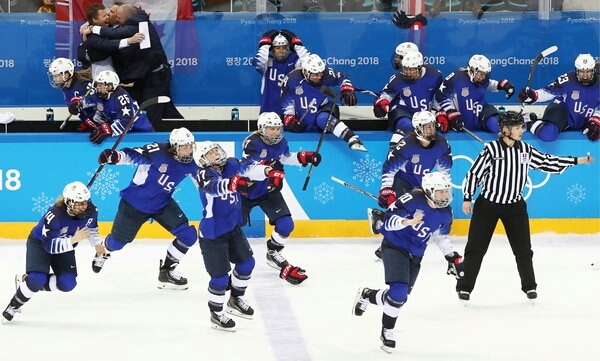 PEYONGCHANG, SOUTH KOREA—The United States women’s hockey team captured gold over their arch nemesis- Team Canada, 3-2, decided by a thrilling shootout in the Gold Medal game on Wednesday, February 21. Team Canada had won four consecutive gold medals, including the headtbreaking gold in 2014 during the Sochi Olympics in 2014, when Canada overcame a 2-0 defecit to eventually steal gold from the U.S. women’s team. There were nine returning members from Team USA who remember that night. This game was redemption for the United States! The game began in favor of the Red, White and Blue scoring the first goal making it 1-0. Canada responded by adding two goals in the second period, giving Canada the edge, 2-1 heading into the third period. The heroes of this Gold Medal Match are the Lamoreaux sisters. First, Monique Lamoreaux evened the score with a slapshot tying the score at 2 apiece, sending the match to overtime. In the captivating 20 minute OT, neither team was able to place the puck in the net. However, the United States effectively held off a Canadian powerplay in the waning minutes of overtime. After four exhausting periods, we had a shootout to decide the Gold Medal. Even after five attempts, we were still knotted. A sixth shot determined the cathartic conclusion. Jocelyn Lamoreaux-Davidson (Moniques twin) stood at center ice ready for gold. Breezing down the ice, she did a triple shake and bake before gently tapping the puck into the back of the net. The other hero was U.S. Goalie, 20-year old Maddie Rooney. The new “Seceratary of Defense” was phenomenal. She made a kick save to earn the top prize. Her teammates were scrambling over the bench wall; gloves were flying all over the ice as the Americans finally celebrated at the end of an Olympic tournament. When they reached Rooney, they piled on. One display by Team Canada was outright disrespectful. Most notably, Canada’s Jocelyne Larocque took her silver medal off of her neck almost as soon as she received it. This is the United States first Gold since the Nagano games in 1998.